Stella McCartney yesterday invited Noel Fielding, Julian Barratt and the rest of the crew from cult show The Mighty Boosh to come and entertain guests at the annual Christmas party held in her London boutique. 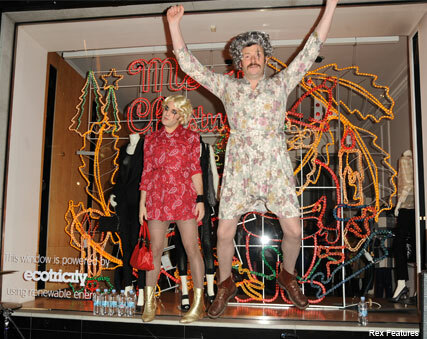 Every year Stella throws a decidedly alternative soiree to celebrate the switching-on of the Christmas lights at her Bruton Street store – last year saw Peter Kay dressed as his on-screen counterpart Geraldine Granger – and thanks to the Boosh boys, 2009 was no exception. 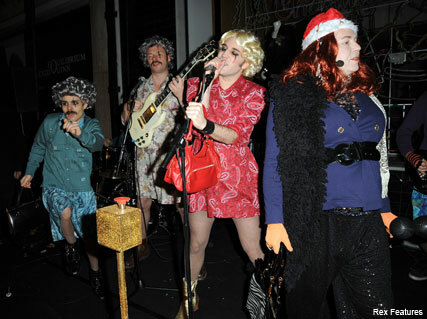 Comedians Noel and Julian pranced around in front of the twinkling Christmas lights and performed a couple of songs for the rest of the guests, all the while dressed up as grannies from the ‘Nanagedden‘ episode of their popular TV series. But while the boys were playing dress-up, Stella was as chic as ever, showcasing pieces from her own collection in the form of some lace-panel leggings and a structured satin blazer. Other guests at the festive bash included close friend Twiggy, her sister Mary McCartney, Jools Holland and cute couple Jamie and Louise Redknapp.